Whether you have just completed your graduation or looking for a job. The first thing you need to do is a build a professional Resume. In professional world a company hires an employee by checking his/her resume. An HR usually receives thousands of resumes per day, So you really need to be creative with your Resume. Resume Or CV is like your first and last impression, So you really need to stand out of the crowd. Although there is some difference between Resume and CV(curriculum vitae). Resume is comparatively shorter than CV as it just includes details about your educations, skill and experiences. On the other side CV includes in-depth details of your education, achievements and career biography. 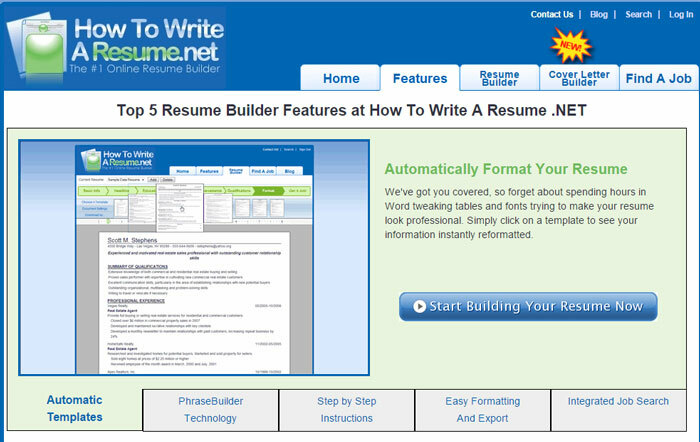 So here are some Resume builder websites which let us create professional Resume totally free. If you are too serious about your resume then kickresume is what you need. It has lots of templates and tools using which you can create professional looking resume. One of it’s best feature is it automatically corrects grammatical mistakes so that you can make a positive first impression on your employer. You can totally customize colors, fonts, formats of your resume and cover letter. The free plan have limited number of templates & customization. If you want more templates and customization then you can go with the premium plan which cost 4$ a month. Resume.io is one of the best online resume builder where job-seekers can build a professional resumes in minutes, create cover letters and keep track of their job applications. Use professional field-tested resume templates that follow the exact ‘resume rules’ employers look for. It also offers professional resume template designs, resume content writing tips and recommended resume structures, that they believe are key to getting noticed by hiring managers. You can get a 7 day premium plan just for $2.95 where you can create unlimited resumes using their professional templates. 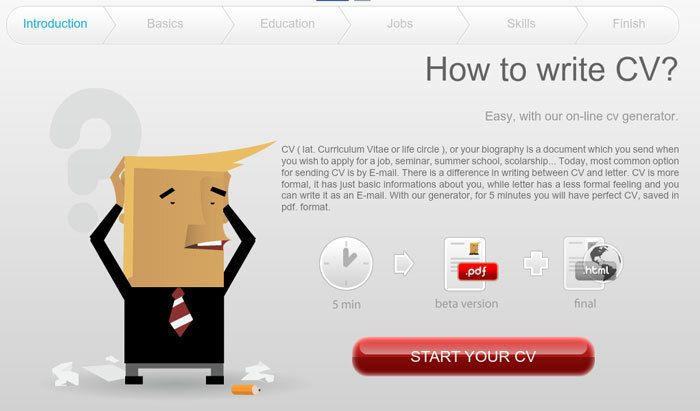 CV maker is one of the most professional Resume builder available out there. To build a professional Resume all you need to do is fill some form with your information and you’re done. If you are lazy to fill the forms then you can sign up with your Facebook or Google+ account so that it automatically syncs all your personal details. Also you can download your Resume in various formats like PDF,HTML, Txt. Technology has changed the way we do things. In few years you will find resumes in form of info-graphics. 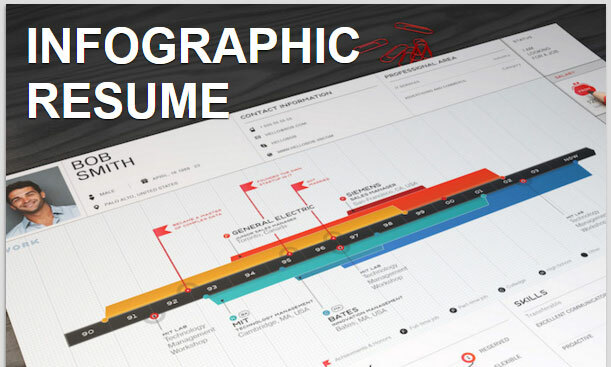 Resumup allows us to create a professional info graphic resume. As info-graphics are very appealing they may stand out of the crowd. 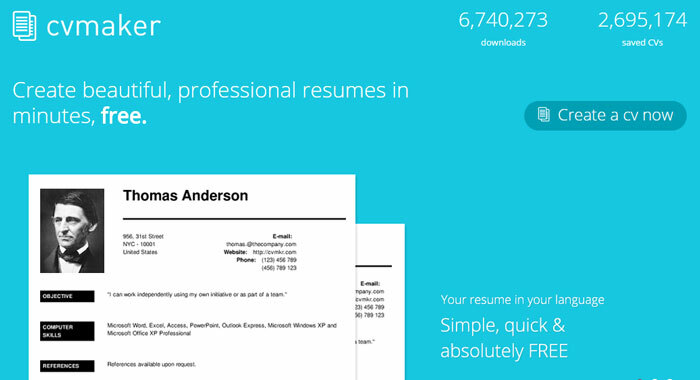 SlashCV is one of the easiest tool to create your resume online. Simply fill your information in desired sections (such as contact info, objective, education) and you’re done. 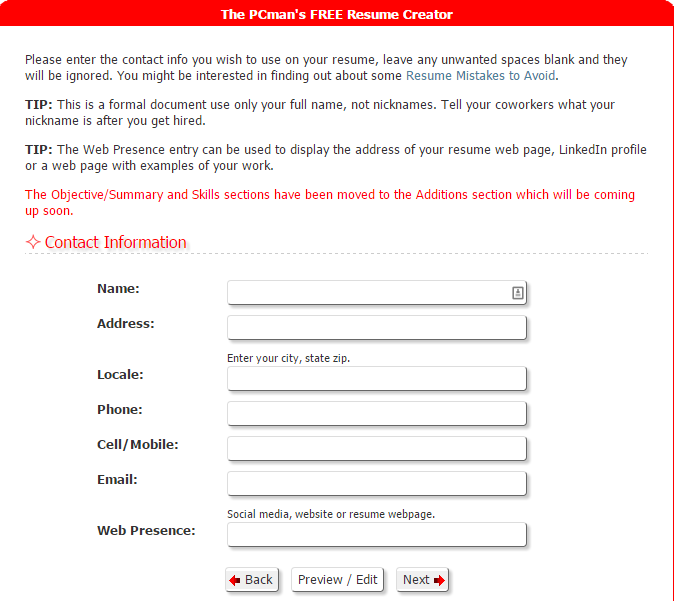 Online CV Generator is quite a basic Resume builder which lets you create classic resumes or CV. Unfortunately it allows us to save our Resume only in PDF format. 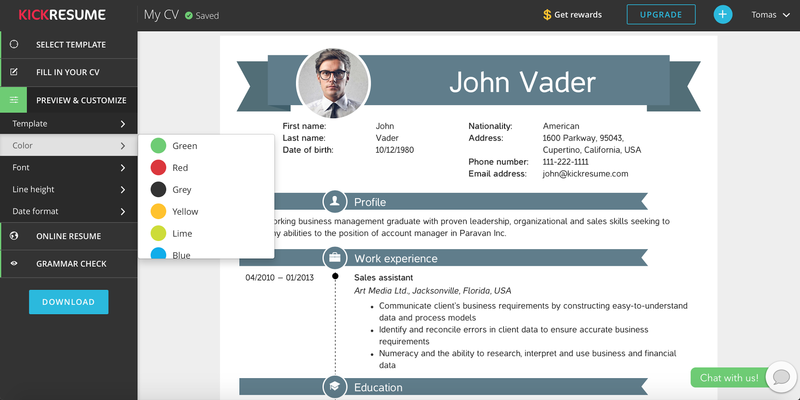 This is an awesome tool which allow us to create Resumes in 6 different styles. The best part is you don’t need to sign up for an account, simply fill your information and download your resume. You can also use different font styles and colors. Visual CV let us create a visually appealing CV with images,videos, graphs,etc. Nowdays interviews are happening online. So it’s better to create multimedia rich Resume which make you stand out of the crowd. This site not only provides effective tools to build a professional Resume but it also provides local job search engine where you can seek for new jobs. Also you can find some sample resumes and tips to build the perfect Resume. 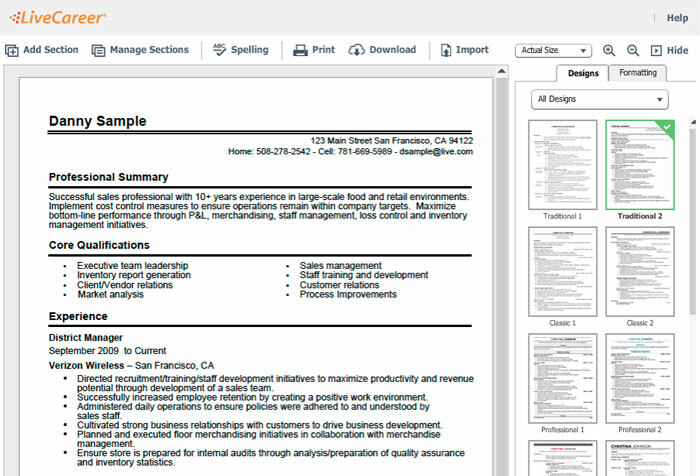 This tool promises to create a professional Resume in just 5 steps. The best part is it has various different templates which you can choose for your resume. Just fill your information and select the design you want. 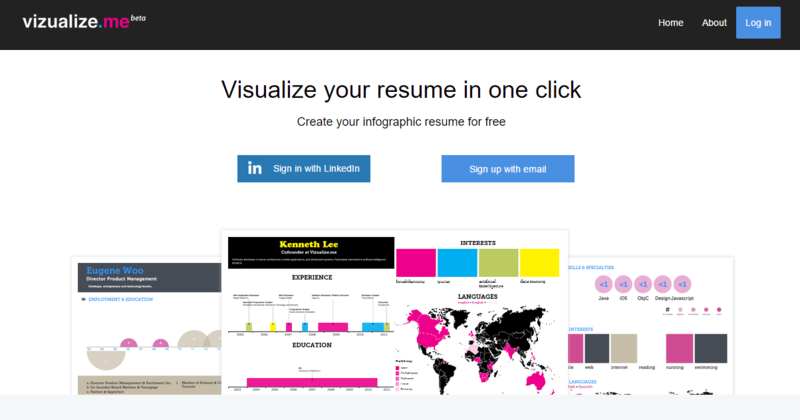 This tool is similar as Resumup as it let us create an infographic resume. It has lots of beautiful themes which will make your Resume look more appealing. 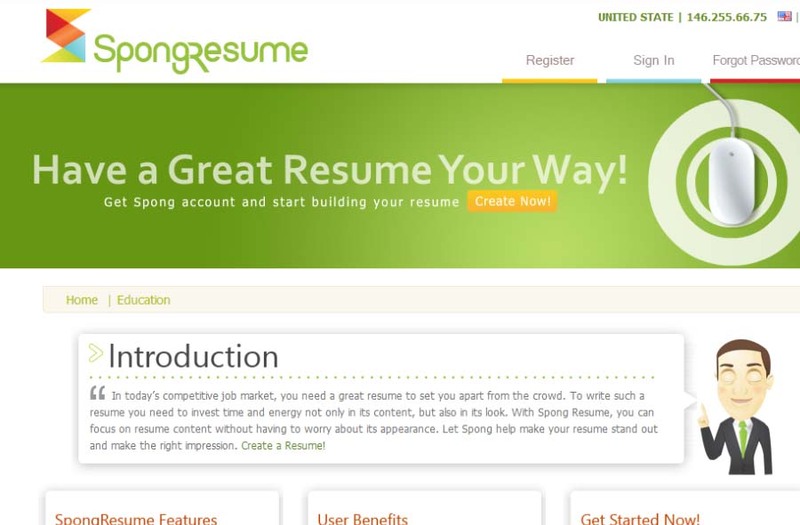 Spong Resume is a great Resume builder which provides unlimited storage to store your resume. Apart from that is a Multilingual Resume builder with lots of professional Resume templates.